Manitoba Canola Growers initiated a project to cold-press canola from various parts of the province, discovering rich regional flavours. Six farmers have kept it going. Six Manitoba canola growers are bottling and marketing cold-pressed canola oils with flavour characteristics unique to their own farms. Described as ‘Prairie magic in a bottle’, the oils are a locally-grown alternative to imported extra-virgin olive oils. Bruce Dalgarno, who farms at Newdale, Man., admits the past year and a half since the growers joined forces to form CanFarm Foods Ltd. has been anything but easy, but he and the other farmers are extremely proud of the work they have done. Cold-pressed canola oil comes from mechanically pressing and grinding the seed at a slow speed with temperatures not exceeding 60°C. While the process means less oil is extracted, the end product is extremely unique. The terroir – a combination of geography, geology and climate – gives each region’s oil distinct differences in colour, flavour and even nutritional profile. Described as earthy, grassy and nutty, these distinct vintages are perfect for adding flavour to bread dips, salad dressings and marinades or drizzling over a variety of foods as a finishing oil. 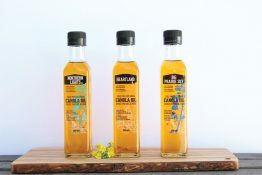 CanFarm Foods produces three cold-pressed oils – Northern Lights, Heartland and Big Prairie Sky – from the Interlake, Pembina Valley and Parkland regions of Manitoba. A 250ml bottle retails for around $10. As a premium, specialty product, a 250ml bottle retails at $10 – about 20 times the price of conventional canola oil. 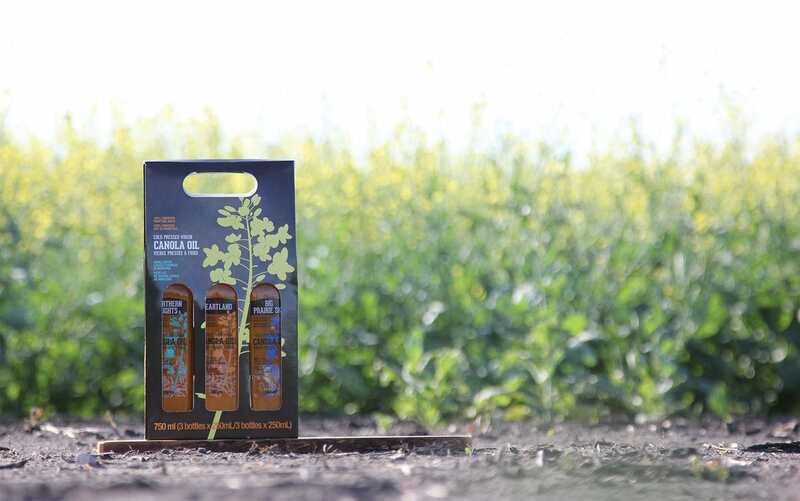 CanFarm Foods produces three cold-pressed oils – Northern Lights, Heartland and Big Prairie Sky – from the Interlake, Pembina Valley and Parkland regions of Manitoba. As developing new markets is one of MCGA’s goals, the organization launched a research project in 2014. The Manitoba Agri-Health Research Network (MAHRN) studied virgin, cold-pressed canola oil, meal and co-products from processing. Growing Forward II provided $396,000 funding and MCGA contributed $10,000. 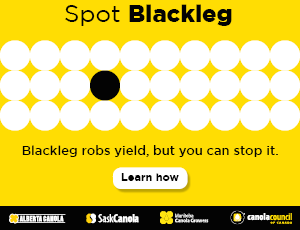 The concept of this value-added oil began with Ellen Pruden, education and promotions manager with the Manitoba Canola Growers Association (MCGA). She noticed slight taste differences in conventional canola oil, was aware of terroir in other foods and beverages and knew there was a growing consumer interest in cold-pressed oils. The research confirmed terroir did exist in canola. The Food Development Centre in Portage la Prairie provided guidance in getting the product ready for retail and food service testing. Consumers, chefs and culinary professionals approved. The stage was set to fill a niche market. MCGA put out a call for members interested in the commercialization of these new oils. Seventeen farmers initially expressed interest, but in the end it was Brian Chorney and son-in-law Kyle Norquay from Selkirk, Bruce Dalgarno from Newdale, David Reykdal and daughter Rebecca from Winnipeg Beach and Keenan Wiebe from Starbuck who incorporated CanFarm Foods in July 2017. Each stakeholder contributed $10,000 to get the company off the ground. Dalgarno acknowledges getting the oil from farm gate to market has been slow and frustrating. The paperwork and legalities were easy. The challenges included sourcing reasonably priced packaging to improve margins, obtaining accurate nutritional analysis, development of new labels, marketing, shipping costs, working with facilities to crush and bottle the oil, and maintaining consistency in the amount of oil per bushel crushed. Yet despite obstacles and set-backs, the partners are anxious to move ahead. Economic benefits will depend on how the company fares. But those involved speak more passionately about the opportunity to connect directly with consumers and share their farm story. “I believe our long-term sustainability goals and the way we work our land means a lot to people who are concerned about where their food comes from,” Chorney says. Sales to date have been mostly consumer-driven through retail outlets in Winnipeg and rural Manitoba. A few chefs are using the product, including Kyle Lew of Chew Restaurant in Winnipeg. Online sales have seen the product shipped to Toronto, Vancouver and even New York. Media coverage in the Toronto Star, Chatelaine, Canadian Living and Manitoba Co-operator has been beneficial. Last fall, Dalgarno took Big Prairie Sky oil to the Great Manitoba Food Fight, a competition featuring Manitoba entrepreneurs who have developed, but not fully commercialized, new and innovative food or alcoholic beverage products. While it didn’t win, he says the experience was phenomenal with valuable connections made in the food industry. Find out more about CanFarm Foods and its canola oils at xvcanolaoil.com. The local, authentic food movement is strong and growing – and with it, the potential for increased sales. As an example, CanFarm’s oils were purchased by a company this spring for a customer-giveaway. Made-in-Manitoba gift baskets and food box subscription services offer alternatives to direct retail sales. Sandi Knight is a farm-based freelance writer from Macdonald, Man.